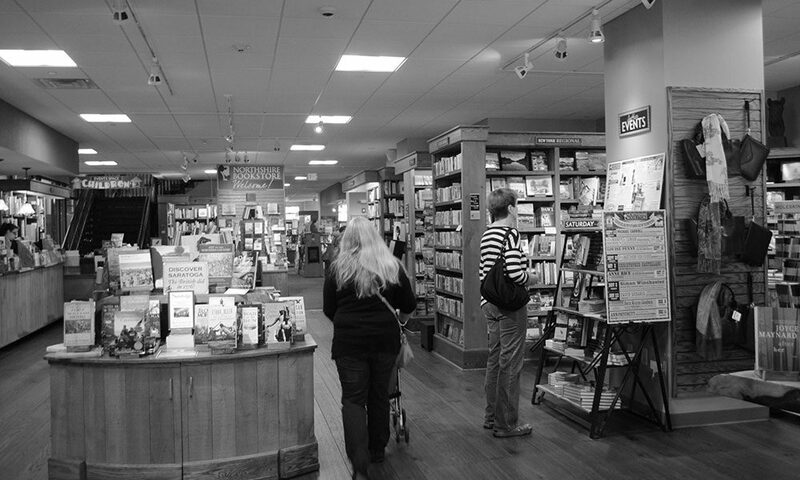 This season's top books recommended by Saratoga Springs' vendors like Northshire Bookstore. From books of local historical interest to the latest in acclaimed fiction, this season offers plenty of enticing options for the book lovers on your holiday shopping list. Remember to support your local bookstores! Saratoga Living and local booksellers offer the following suggestions for great books to bestow on friends and family this season. Historical accounts have never sufficiently recognized Luigi Del Bianco, an Italian immigrant who was the chief carver of Mount Rushmore, claims local author and Saratoga Living contributor Douglas Gladstone. In Carving a Niche for Himself: The Untold Story of Luigi Del Bianco and Mount Rushmore (Bordighera Press, $12), Gladstone tells how Del Bianco, an artisan stonecutter, worked alongside sculptor Gutzon Borglum to produce the enduring granite likenesses of four iconic American presidents. Saratoga Springs owes much to Franklin D. Roosevelt, who as New York governor and U.S. president built a world-class European-style spa on the grounds of what is now Spa State Park. Roosevelt got the Ken Burns treatment this fall when the popular historian chronicled the lives of Franklin, his cousin Teddy and wife Eleanor. The oversized The Roosevelts: An Intimate History (Knopf, $60) by Geoffrey C. Ward and Ken Burns is the lavish and image-rich companion volume to the seven-part PBS series. Saratoga is renowned for its role in turning the tide of the American Revolution. New Hampshire farmer and general John Stark was instrumental in making that happen, but not many people know his story. Stark: The Life and Wars of John Stark (Black Dome Press, $21.95) recounts how Stark and his force of militia and Green Mountain Boys routed the British during the Battle of Bennington in Hoosick, New York. It was the beginning of the end of the British invasion, setting the stage for the Battle of Saratoga and the surrender of General Burgoyne two months later. Last year, the Saratoga Room of the Saratoga Springs Public Library acquired over 1,000 rare stereoscopic images of Victorian-era Saratoga collected by local antiques dealer Robert Joki. You can view many of them in Joki’s formerly out-of-print 1998 book, Saratoga Lost: Images of Victorian America, recently reissued by Black Dome Press ($27.95). The book depicts scenes from a golden era when health- and pleasure-seekers flocked to the region’s bubbling mineral springs. The vast wilderness next door has a fascinating history, comprehensively covered by Paul Schneider in The Adirondacks: A History of America’s First Wilderness (Holt, $21.99), now in paperback. “If you’re looking for an all-in-one history lesson, this is it,” recommends bookseller Chris Linendoll of Northshire Bookstore, which has stores in both Manchester, Vt., and Saratoga Springs, N.Y. “Even after being assigned this book for a college course years ago, I still find myself coming back to this book all the time. Truly a landmark work.” The basis for the classic film starring Gary Cooper and Ingrid Bergman, Saratoga Trunk (Harper Perennial Modern Classics, $13.99) is a 1941 novel by Pulitzer Prize winning novelist Edna Ferber. Rachel Person, Northshire Bookstore’s events and community outreach coordinator, calls it a “forgotten classic worthy of a revival.” The schemes of Clio Dulaine, the daughter of an aristocratic family, and Texas gambler Clint Maroon take them to the luxurious resort of Saratoga, N.Y. It’s a “fabulous tale of Saratoga high society in its heyday—as experienced by a pair of wily grifters,” says Person. When ad exec Josh Kilmer-Purcell and his partner, physician Brent Ridge, purchased the historic Beekman 1802 Farm in Sharon Springs in 2007 as a weekend getaway, they likely didn’t know that they were about to launch one of the fastest growing lifestyle brands in the country. Now reality show stars, the Beekman Boys have added another cookbook, The Beekman 1802 Heirloom Vegetable Cookbook (Rodale Books, $32.50), to their growing empire. “Simple, delicious, vegetable-focused recipes. Yum,” raves Connie Brooks, owner of Battenkill Books in Cambridge, N.Y. In her previous book, Mud Season, Ellen Stimson hilariously chronicled her rocky transition from city living to a 100-yearold farmhouse in Dorset, Vt., where she took over the old-fashioned village store. With the follow-up, Good Grief: Life In A Tiny Vermont Village (Countryman Press, $23.95), we get more tragicomic and moving tales about family life in a small, rural town. “Stimson’s life is full to the brim with love, food, kids, candles, humor, pets and—grief,” says Northshire Bookstore bookseller Karen Frank. “This wild ride began last year with Mud Season and ends with her serenity and quiet wisdom, accepting that good grief is a product of a good life.” The Language of Food: A Linguist Reads the Menu by distinguished linguist Dan Jurafsky (W. W. Norton & Company, $26.95) is an entertaining look at the relationship between food, language and history. “Foodies and anyone interested in trivia, etymology or culinary history will enjoy this exploration of how culinary terms evolved in some very surprising ways through time and across cultures,” says Northshire bookseller Jennifer Canfield. Local readers voted on this year’s selection for Saratoga Reads, a community-wide reading program. The pick: The Round House (Harper Collins, $15.99) by author Louise Erdrich. Winner of the 2012 National Book Award, the novel takes place on North Dakota’s Ojibwe reservation, where a 13-year-old hunts for the perpetrator of a violent crime. “Through Erdrich’s words and Joe’s voice, Round House provides our community the opportunity to explore contemporary Native American culture as well as contemporary issues that know no boundaries,” says Tabitha Orthwein, Saratoga Reads board chair. Station Eleven (Knopf, $24.95) by Emily St. John Mandel is a “post-apocalyptic, post-pandemic vision of the future” recommended by Battenkill Books owner Connie Brooks. In the suspenseful and captivating novel, a fictional flu pandemic kills the majority of the world’s population. Among the survivors is a ragtag theater troupe known as the Traveling Symphony, whose musicians and actors roam the desolate wasteland that’s left performing Shakespeare for fellow survivors. We Are Not Ourselves is a well-reviewed, multigenerational debut novel by Matthew Thomas (Simon & Schuster, $28). The full impact of this remarkable story of an Irish- American family—spanning from the 1940s in Queens, N.Y., to the present day—doesn’t hit until the last few pages. “The elusive American Dream is partially realized along with all the twists and turns of choices and events not taken,” says Northshire’s Karen Frank. The Bone Clocks is the New York Times best seller by acclaimed author David Mitchell (Random House, $30), which was long-listed for the Man Booker Prize. “Highly recommended,” says Northshire’s Sarah Knight of the epic metaphysical tale. With Colorless Tsukuru Tazaki and His Years of Pilgrimage (Knopf, $25.95), Japanese author Haruki Murakami demonstrates his “unimaginable gift for turning the written word into feelings of melancholic nostalgia and this is the best thing he’s written in years,” enthuses Northshire’s Chris Linendoll. Ruin Falls (Ballantine Books, $26) by Jenny Milchman, who appears at Northshire Bookstore on December 12 in a joint appearance with author Charles Salzberg (Swann’s Lake of Despair), is a suspenseful novel set right in our backyards. Inspired by the author’s own cross-country trips to read at bookstores, the story follows a family who leave their home in a secluded part of the Adirondack Mountains in order to visit the children’s grandparent’s farm in western New York. After a stop at a hotel, the children disappear without a trace—and it’s up to their mother to save them. In 2009, a real-life moose caused quite a stir when it sauntered through downtown Saratoga Springs before taking up residence at the Saratoga Race Course main gate. Saratoga Springs author Vicki Addesso Dodd and illustrator Patrick Jankowski revisit the true tale in the colorfully illustrated A Moose in My Stable (Saratoga Springs Publishing LLC, $12.99), where a wayward moose finds the Saratoga racetrack so inviting that he decides to live there. Trouble ensues. There are over 160 animal specimens to be discovered in Animalium (Welcome to the Museum), by Jenny Broom and illustrated by Katie Scott (Big Picture Press, $25.20), the first in a series of virtual museums that “is like having a natural history museum on your bookshelf. Beautifully illustrated,” says Battenkill Books’ Connie Brooks. Local illustrator Annie Dwyer Internicola and author Elizabeth Maginnis have just released There’s a Dog on the Dining Room Table (Xist Publishing, $9.99), a charming rhyming story about the crazy antics of an unexpected visitor to the family’s dining room table. Saratoga Springs author Jennifer Armstrong has penned a number of books for children and young adults. She recommends several books of local interest for young readers. Good Night New York State (Good Night Books, $9.95) by Adam Gamble is a board book that tours the Empire State, “with a ride on the carousel in Congress Park, a cruise on Lake George and a starlight ski in the Adirondacks,” says Armstrong. Hello, Adirondacks! (Commonwealth Editions, $9.95) by Martha Day Zschock is a rhyming board book that follows a family of cheerful bears on “a tour of Adirondack beauty spots, from mountain to stream to lake.” George Crum and the Saratoga Chip (Lee & Low Books, $8.95) by Gaylia Taylor uses dynamic illustrations to tell the story of Saratoga’s claim to the birth of the potato chip. And youngsters will enjoy A Horse Named Funny Cide (Putnam Juvenile, $16.99) by the Funny Cide Team with illustrations by Barry Moser, a story about the winning New York-bred colt. “Full of fun details about raising and training a racehorse” for racing fans aged eight and up,” says Armstrong. And finally, for teens, Egg & Spoon by Gregory Maguire (Candlewick, $17.99) is a dazzling fantasy novel based on the Baga Yaga stories from Russian folklore, recommends Battenkill Books.